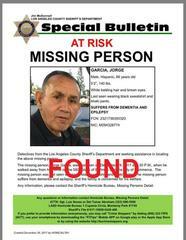 East LA missing person Jorge Garcia was found safe and uninjured on Saturday, December 30, 2017 at approximately 0650 A.M. in the vicinity of the 605 Fwy and Florence Avenue, in the City of Downey. With the assistance of the California Highway Patrol, Mr. Garcia was reunited with his family. Los Angeles County Sheriff's Department Missing Persons unit would like to thank the public for their assistance in locating Mr. Garcia. Detectives from the Los Angeles County Sheriff’s Department Missing Persons Unit are seeking the public’s assistance in locating Jorge Garcia, a 66-year-old Hispanic man who suffers from dementia and epilepsy. He was last seen walking away from his residence, located in the 5800 block of Bartmus Street, City of Commerce, on Friday, December 29, 2017, at approximately 4:30 P.M.
Jorge is described as 5’2” tall, weighs 140 pounds, has white balding hair and brown eyes. He was last seen wearing a black sweat shirt, and khaki pants. Jorge Garcia’s family is very concerned for his well-being and is asking for the public’s assistance in his safe return.